Di: Stage Exp 01 Clear Ver. Distributed by Good SMILE Company. This is the Di: Stage Exp 01 Clear Ver. The Di: Stage is a fun and imaginative base for figures. This is the first Expansion for the Di: Stage and comes with a set of short poles and long poles so that if you have more than one Di: Stage Basic sets you can create even more dynamic and fun base styles. 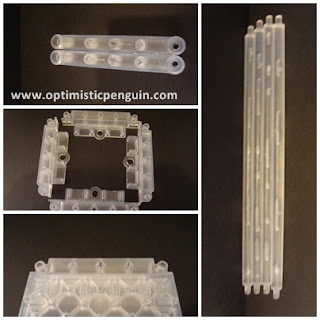 The Exp 01 set also comes with all the necessary pieces to attach the poles as well as some piece which can be used as a hinge to connect either poles of Di: Stage squares together. 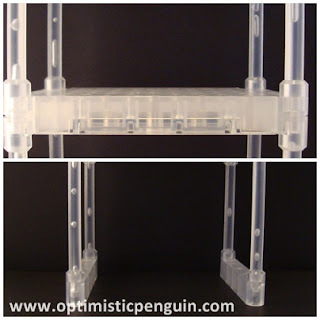 And so there the more sets you have the more options and combinations of structures you can create. The Di: Stage Exp 01 allows figures to have a great range of posability. When combined with the Di: Stage Basic you can now create platforms at different heights, staggering them to make stairs, or just creating different levels to display figures on. And as stated above the more sets you have the more possibilities there are. Di: Stage Exp 01 Set comes in a small box. The front has an image of the set on it, and a picture of the Di: Stage with a figure. 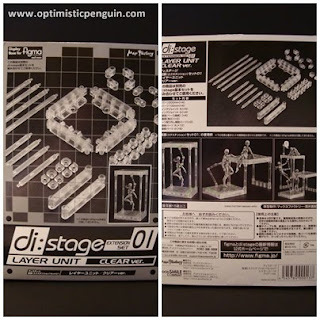 On the sides of the box is the Di: Stage logo, and on the back are an image of the set and its pieces, and some more photos of the Di: Stage and figures, also all the important information is on the back, (in Japanese). Is a simple black, grey, and white colour scheme, but is none-the-less a nice design. Inside the components are well protected, with cardboard, bubble wrap and individual plastic bags for each. The Di: Stage Exp 01 set comes with, four short length poles, four long length poles, four side pieces side pieces, which are attached to the sides of the Di: Stage for the poles to plug into. 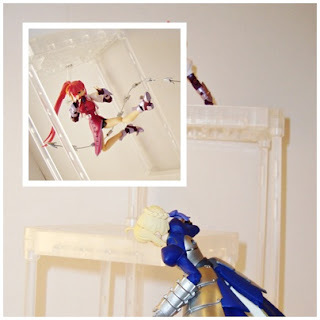 Two pieces are also included for use when poles run from one Di: Stage to the ground, instead of onto another Di: Stage, very good idea on the part of Max Factory. 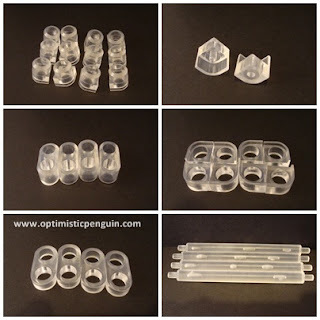 There are twelve pieces which clip onto the side pieces which the poles go into; there are also eight pieces which slot onto side pieces where poles are not in, so that you can have a level top or bottom to the Di: Stage. Then there are four full size four half size hinges which slot onto side pieces and poles so that Di: Stage's can be all hingey! And finally to pieces which I to be honest don't know what they are for, and could not work out from instructions, to me they don't seem to have a use, and do not fit securely on any or the pieces just sit loosely on things doing I don't know what. The Di: Stage Exp 01 is great. Now I have even more display possibilities. I can have a staggered display, a staircase, or just some really interesting designs. As you can see in the picture bellow you can do a number of interesting displays. I think I will possibly buy some more basic sets so that I can make even more fun structures with my Exp 01 sets. There are also downloadable paper diorama’s available from the Max Factory Figma website and blog, these you can print of, cut and fold, and slot them on to your Di: Stage Set's thereby creating scenes for your figures to be displayed in. So over all my enjoyment of the Di: Stage Exp 01 is high. Over all, the Di: Stage Exp 01 was a great investment, now my figures have more fun opportunities for display.